Explanation: Gathered at the center of this sharp skyview are the stars of Messier 67, one of the oldest known open star clusters. 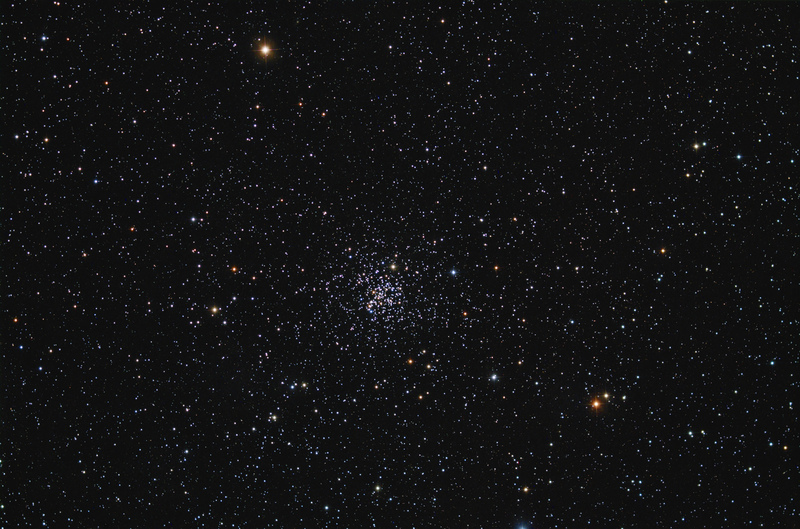 In fact, though open star clusters are usually much younger, the stars of M67 are likely around 4 billion years old, about the same age and with about the same elemental abundances as the Sun. Open clusters are almost always younger because they are dispersed over time as they encounter other stars, interstellar clouds, and experience gravitational tides while orbiting the center of our galaxy. Still, M67 contains over 500 stars or so and lies some 2,800 light-years away in the constellation Cancer. At that estimated distance, M67 would be about 12 light-years across.